I'm going to explain the Dynamics AX 2012 R3 Broker Contract Management that how to set up a broker contract that specifies the commission that a broker vendor receives for the sale of items or groups of items. For example, you might have a contract with a broker that states that every time a specific model of television is sold, the broker receives a percentage of the sales price. Commissions can be calculated based on a fixed amount, a percentage, or an amount per unit. This functionality will help in managing payment of fees to brokers for the service of facilitating sales with broker contract management. This will reduce the administrative burden of broker payments. In the Accounts payable parameters form, in the left pane, click Broker and royalty. Enter the Journal name used to create the vendor liability in the Invoice journal name field. In the Differential journal name field enter the journal name used to post the Cancelled brokerage amount. In the Expense journal name field, enter the journal name used to post to the broker expense account. Select the account which will be used for expenses related to brokerage in the Expense Account field. You can check or uncheck the Manual Posting checkbox to define whether the journal should be posted automatically or manually. In the Accounts Payable Parameters form in the Number Sequences select the number sequence in the Broker Claim Invoice field. 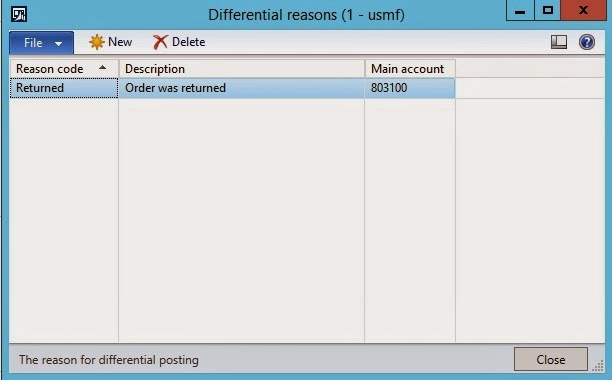 1- Create the differential Reason Code and attach accounts for posting the differentials, in case of any differential exists for Broker commission. 2- Create the Charges Code for broker contracts and its posting. Select the Prorate check-box on this form and select the options for posting under the Debit and Credit on Charges Code form. Once all these setups are done now we can create Broker Contracts now. To setup broker contracts use the following procedure. In the Broker Contracts form click New to create new Broker Contract in the upper pane. In the Status field select the status as Planning and enter the id in the Broker Contract ID field for the broker transaction. Select the vendor account number for the broker in the Broker Account Number field. Select the dates in the From Date and To Date fields. Select the charges code in the Charges Code field. In the Category field select one of the options (pcs, percent, fixed) to determine how the value will be used to calculate the broker fee and enter the value accordingly in the Charges Value field and also select the currency in the Charges Currency Code field. In the lower pane of the Broker Contracts form we can enter the contract details applicable to the contract and specify the Item code, Item relation and customers or customer groups to which this contract is applicable. To enter the contract details go to Accounts Payable > Common > Broker > Broker Contracts. In the Broker Contracts form, in the lower pane click Add Line to add line to specify the contract details created in the upper pane. In the Item Code field select Table, Group or All for the contract. In the Item relation field select the item number, item group or item discount group as per the selection in the item code field. Select Table, Group or All in the Account Code field to select to which customer this statement applies. Select the Account Number or Customer Group in the Account Selection field. In the Break type field select either quantity or amount which determines the basis for evaluation of brokerage amount. In the Break field, we can specify the break value for the quantity or amount as selected in the Break Type field. Other fields such as Category, Charges Code, Charges Value, and Charges Currency Code it will automatically populate from the Broker Contract line. Planning: Default Status of the Contract when created. The contract line and the contract details can be edited only when the status of the contract is ‘Planning’. Approved: Unless the status of the contract changes to Approved, the contract terms and broker fees are not applicable on the sales transactions. Cancelled: The status of the broker contract should be changed to Cancelled to cancel the contract terms. Closed: The status of the contract is Closed when the broker contract is closed. Note: We cannot use the broker contract on the sales order Until the Status of the contract processing in the Broker Contract form is changed to Approved from Planning, the contract terms are not applied on the sales orders. Now once the contract status is changed to Approved in the Broker Contract form, we can see the broker commission is generated as per the terms in the broker contract on the sales order line. 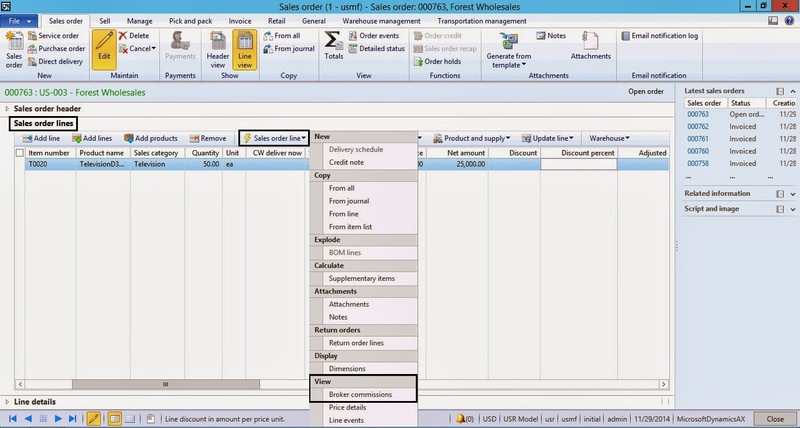 To view the broker fee generated for the sales order transactions, create a sales order for the item and the customer as specified in the broker contract. Click on the broker commissions in the view group. In the Broker Commission form we can see the broker vendor account, broker contract id for the transaction and the applied value for the contract. After the sales order is invoiced, we can see the lines created for the Broker payments in the Broker Claims form with open status where we can view all the broker claims filtered based on different parameters and also Approve or Close the broker claims and make the broker payments. Once the claim is reviewed, we can approve or close the Claim. In order to approve the broker commission claim, enter the approving amount in broker lines under 'Approving' field. Click on 'Approve' button to approve the claim, system will automatically post the claim and expense journals in General journal GL module. 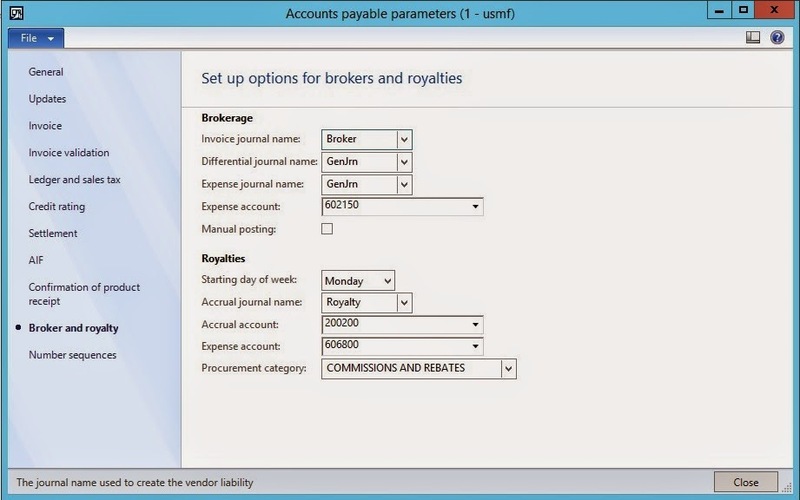 Note: If the Manual check-box is not marked in the Accounts Payable Parameters > Broker and Royalty the journals will be posted automatically to post the amount in the respective accounts as mentioned in the initial setup. We can process the Vendor through the Accounts payable module using the payment journal under the Journal section as standard Dynamics AX vendor payment works. Note: Once the status is Closed you cannot edit the Broker Claim. Association Evaluation who buys a condo receives a set of the covenants, conditions and restrictions (CC&Rs). Before they sign the contract, the selling agent must disclose what the rules and regulations of the association are. There could be restrictions about pets roaming free, overnight guest parking, or types of landscaping the owners can put on their patios or balconies. Federal, state and local laws dictate what can be included in the rules and regulations. Thank you for this post. It's really helpful to understand the new functionality in AX 2012 R3. I have one small query. Could you please elaborate / give any example so that I can check when the GL code 602150 will be used for Broker expenses ? I just want to see the usage of this GL in AX, that's it.